Design pervades our lives. Everything from drafting a PowerPoint presentation to planning a state-of-the-art bridge embodies this universal human activity. But what makes a great design? 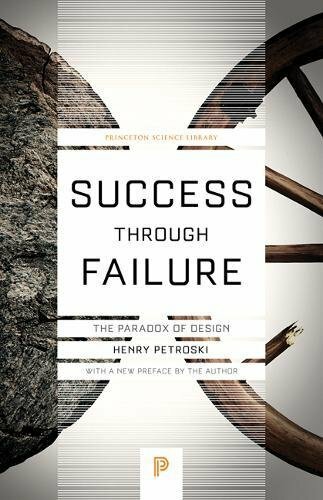 In this compelling and wide-ranging look at the essence of invention, distinguished engineer and author Henry Petroski argues that, time and again, we have built success on the back of failure–not through easy imitation of success. Success through Failure shows us that making something better–by carefully anticipating and thus averting failure–is what invention and design are all about. Petroski explores the nature of invention and the character of the inventor through an unprecedented range of both everyday and extraordinary examples–illustrated lectures, child-resistant packaging for drugs, national constitutions, medical devices, the world’s tallest skyscrapers, long-span bridges, and more. Stressing throughout that there is no surer road to eventual failure than modeling designs solely on past successes, he sheds new light on spectacular failures, from the destruction of the Tacoma Narrows Bridge in 1940 and the space shuttle disasters of recent decades, to the collapse of the World Trade Center in 2001. Petroski also looks at the prehistoric and ancient roots of many modern designs. The historical record, especially as embodied in failures, reveals patterns of human social behavior that have implications for large structures like bridges and vast organizations like NASA. Success through Failure–which will fascinate anyone intrigued by design, including engineers, architects, and designers themselves–concludes by speculating on when we can expect the next major bridge failure to occur, and the kind of bridge most likely to be involved.